A real big shout out to Desmos, Dan and Christopher for their work on the Function Carnival. "If you think that something is true, you should try as hard as you can to disprove it. Only then, can you really get at the truth and not fool yourself." This video could not have come at a better time. In fact, Derek sums up in about 4:40 what's taken me a semester to convey to my students. 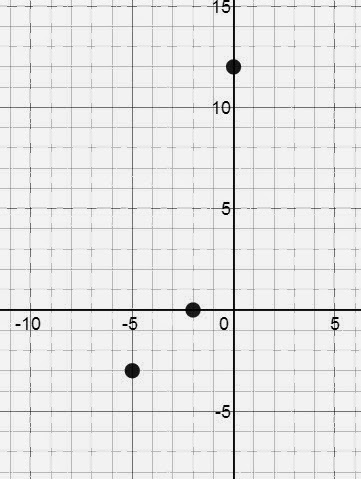 Last week's quiz asked students to investigate a parabola given these three points. Naturally, many assumed that (-5, -3) was the vertex. However, upon close examination, they should have realized that the rates of change between the points wouldn't allow that. So, the next day, we set out on an exploration. "Ok, open up Desmos, plot the points and find a quadratic that fits these points." It didn't take long before a student came up with y = x2 + 8x + 12. We all verified it and then I suggested we try something else. "Enter the function y = a(x - h)2 + k and make sliders for a, h and k. Now find a function that fits." Soon we had y = (x + 4)2 - 4. Students loved this form because of the obvious horizontal and vertical shifting that was going on. Is y = x2 + 8x + 12 the exact same function as y = (x + 4)2 - 4? If so, is there a way we can take a quadratic in standard form and re-write it in this magical form? We spent the better part of a period graphing functions in standard form and then matching them in vertex form. "Now, look at all the different functions you have. Write down what you think is going on here. Note: To this point, all quadratics have been a =1. Their job over the next day is to determine which hypotheses (if any) they'd like to accept.